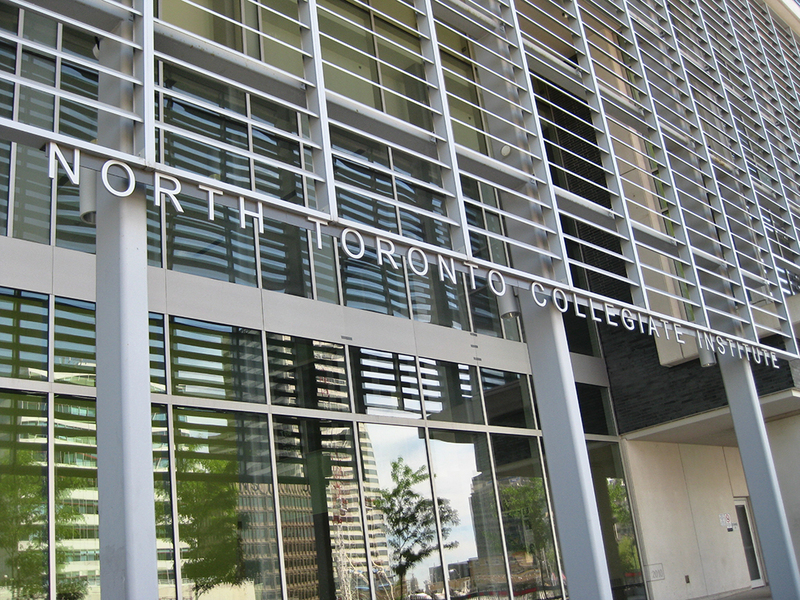 North Toronto Collegiate Institute was recently re-built alongside two new condo towers in the Yonge and Eglinton area thanks to a unique partnership between the Toronto District School Board (TDSB) and Tridel builders. With the high school, originally built in 1912, slowly crumbling and the TDSB not able to foot the bill for repairs, never mind a new building, another approach emerged. TDSB was prepared to sell two parcels of adjacent land that could be spared to a developer who would then build a new school along with condo towers. Tridel was chosen out of ten submissions and the deal resulted in The Republic, a twin-tower condo development built alongside a new school with underground parking, a state-of-the-art theatre, science labs and a green roof. The school and the condo buildings are LEED (Leadership in Energy and Environmental Design) certified. Happily, a large football-sized sports field and running track are also part of the development and available to the public when the school is not using them for athletic events. The west side of the school includes several pieces of artwork that were commissioned especially for this space. When residents don’t have a child attending a local school they usually don’t think of the school as part of their community. By adding artwork, the TDSB and the builder have made a gesture to link the school to the community, to increase awareness of its presence, its purpose and history and to enhance the neighbourhood. These pieces are a welcome addition to a public space and rare among public school properties in Toronto. The descriptions that accompany the photos are mostly what appear on plaques alongside the artwork. “Words are the building blocks for thought. They give shape to our ideas. These cubes embody the energy and power of words within a structure of reason and order. Yet thought is without physical substance so these words dissolve in the shifting light, personifying the effervescence of our intellectual journey. These are the names are of the students who attended the original school from 1912 to 2010. Each first name appears only once, with 2053 names shown. These are contrasted with the signatures of alumni and current students.